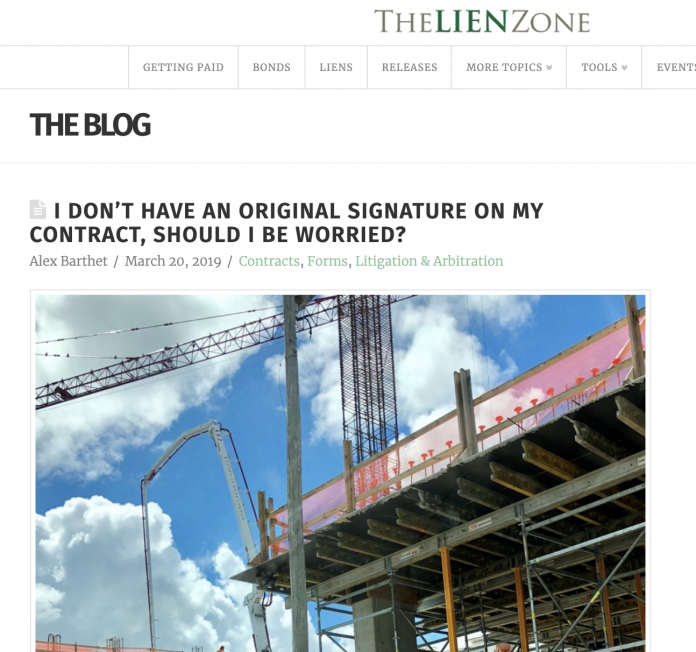 The Lien Zone blog published by Miami Construction Lawyers touches close to home for two reasons. First, one of our publications, Florida Construction News, has become a vital and effective resource for Florida-area contractors, subtrades, suppliers, owners, architects and engineers. Second, and in an entirely different geographical space, we are preparing to launch Ontario Construction News as a daily publication on May 1. The entire reason for this publication — and its intensive schedule — is Ontario’s construction legislation, now called the Ontario Construction Act, formerly known as the Ontario Construction Lien Act. The second point raises the issue that construction lien rules vary by state and (in Canada) province. Ontario may be one of the few jurisdictions that require Certificates of Substantial Completion (CSP) to be published in a “daily newspaper serving the construction industry” to protect/perfect lien holdback rights. The previous law’s wording effectively granted something extremely rare in business to another publication: A legal monopoly. You need to publish the CSP notice to protect your lien rights in Ontario, and the economics of setting up a full-scale print daily newspaper to compete would be folly — so the other publication simply needed to employ clerks to accept orders for the expensive yet mandatory notice ads. The new rules, which were introduced in law last July and are starting to take effect now following transitional provisions, add two words, “or digital” to define “newspaper” — and created our business opportunity, since we are the only other publisher in this province who can meet the other technical compliance requirements. We can be profitable with a fraction of the overall market share and with advertising prices that will be fifty per cent lower than the competition — creating a rare monopoly-breaking business opportunity. So yes, I’m thinking a lot about construction liens these days. And as my story proves, you should be very careful to consider state/provincial rules in determining your approaches to construction lien issues, though there are definitely common themes and issues. In other words, if you are in Florida or are doing business there, the The Lien Zone will be an incredibly useful tool. If you are outside the state, consider the blog’s ideas and make sure they apply appropriately in your jurisdiction. An example of concepts within this blog that have widespread application would be this post: I don’t have an original signature on my contract, should I be worried? The answer, writes Alex Barthet, is “no”, provided you have other documentation demonstrating the agreement, and have confidence that the electronic signature/communication is from someone truly authorized to sign the document. I think that these observations will be valid in Florida, Chicago, California and Ontario. In conclusion: If you are based in Florida or serve that state’s market, this blog should be a “must bookmark” — the content will be incredibly valuable and relevant to your business. If you are out-of-state, take a look at it from a broader perspective, but be sure to consult with local experts before drawing conclusions. We’re nearing the conclusion of voting for the 2019 Best Construction Blog competition. You can submit one ballot per email address, but you can vote for as many blogs as you wish in the ballot. Voting closes March 31.